This weekend, my bf and I are going to plant some more roses in his front yard. Looking forward to blooms in the spring! On Tuesday I went to San Francisco to watch the SF Ballet perform Swan Lake - the most beautiful of the classic ballets. The story of Swan Lake is so tragically beautigul, especially when Odette sees Odile marrying her prince. I went with Rachael, a friend from high school who is moving back to Louisiana in a few weeks to get her MBA at Tulane. She has a giant list of things to do before leaving SF, one of which was the ballet. Lucky for me, she ended up with an extra ticket and I got to go with her! We met before the performance and got drinks and cheese at a nearby bar. It was fantastic. The San Francisco ballet is held at the War Memorial Opera House and it is gorgeous! Check out the photos of the stage and the atrium ceiling. What a fun night. Thanks for the invite Rach! Happy Mardi Gras everyone! 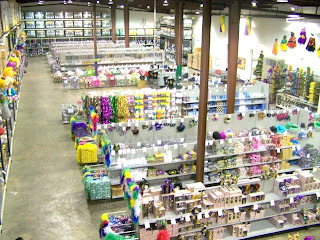 I thought I would share a little mardi gras treat with you - pictures of my Uncle Daryl's warehouse in New Orleans. (He isn't really my uncle, but since he is my dad's best friend and I have known him forever, we all call him uncle). Anyway, he runs a company called Plush Appeal which sells mardi gras beads and throws (plus lots of other things) He has also employed most of my siblings at one time or another. He is known to arrive at my house with a huge bag of stuffed animals - every kid's dream right? My sweet niece is one lucky girl. This weekend I went to the YSL exhibit at the De Young Museum in San Francisco. Yves Saint Laurent passed away last June and this collection is a 40 year retrospective with more than 120 outfits. It was completely lovely - I was in heaven. On Tuesday night, my bf and I went to the Sharks game. The Sharks are on fire right now and they did not disappoint, as they won 4 to 2. In the photo above, the captain - Patrick Marleau is congratulating the goalie Nabby (who is on my fantasy hockey team by the way). They played the Oilers and it was a dirty game - with lots of fighting, which of course made it great to watch! We watched the game with another couple. The woman of the couple made a really funny observation. She said that hockey was like a male musical - that hockey players break out into fights, like actors in a musical spontaneously break into song. I thought it was funny because it is kind of true, especially in this game where the players were looking for any excuse. Check out the photo below- most of the players on the ice were involved in this fight. When I got my most recent issue of Bon Appetit, I was really excited to see that the cover story was on comfort food - my favorite! My boyfriend and I were particularly excited to try a recipe from Bon Appetit magazine called Root Vegetable and Mushroom Pie with Rosemary Biscuit Topping. Since we subscribe to a weekly CSA (community supported agriculture) bag, we ordered rutabaga, turnips, parsnips, and carrots to use in this recipe. Last night we prepped the filling according to the recipe. Tonight all we had to do was bake it and prepare the biscuit topping. When it came out of the oven, the scent was amazing! We were so excited to try it. Because we have many more turnips and rutabagas, we will probably make the filling again and freeze it. I really recommend this recipe! Check out the pictures below that document the process. My boyfriend and I have started to try and eat more seasonal, locally grown veggies and fruits. 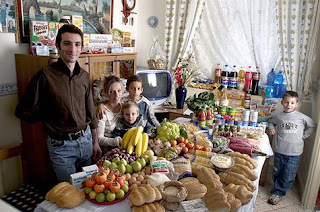 So I was pretty interested when my coworker sent me this blog post that visually shows the typical diets of families around the world. I think that I would like to live in Sicily, Mexico, or Egypt! The photos were taken from a Time magazine piece- see the original 16 photos here. The photos have also been made into a book that you can preview on amazon. photo credit: Peter Mendzel "Hungry Planet"
Cooking class empanadas stuffed with onion (cooked with oil, saffron, and honey), green olives, spinach, golden raisins, and pine nuts. Delicious - although is puff pastry ever bad? What better way to spend Valentine's day then tasting honey? I headed up to Napa Valley this weekend with my honey and his family to participate in a honey themed cooking class. We used honey from Marshall"s Farm which is collected from bees all over the San Francisco Bay Area. Check out the photo above to see how many types we tasted! My favorite was the Napa Valley Wildflower. Mrs. Helene Marshall was on hand to explain how honey is made and mentioned that local honey can help fight local allergies. After our honey tutorial, we got to the business of cooking. Eighteen people cooked 8 dishes which featured seasonal ingredients and honey. However, a suprise came in the form of a cheese plate that was served with a bit of honeycomb. It was fantastic. Who knew that the entire honeycomb was edible? We bought some to serve next time we have friends over. Check it out below. I live in northern California. Although, I grew up in New Orleans, LA and have also lived in Maryland. I am an engineer and work in Silicon Valley. One of my new year's resolutions (yes I make resolutions) was to start a blog to chronicle my adventures for my friends and family around the world. Since it is mid-February (and much has already happened in 2009) I hope to fill you in on the last 6 weeks while I cover the present. p.s. I took this photo in Audubon Park in New Orleans in October.